MainAll NewsPolitics & Gov'tYehuda Weinstein New A-G in Jan.
Yehuda Weinstein New A-G in Jan. The government has decided: Tel Aviv attorney Yehuda Weinstein will be Israel’s next Attorney General, the 12th in Israeli history. The decision was made unanimously, after Justice Minister Yaakov Ne’eman selected him from among four candidates presented last month by a special search committee. The list of candidates was slightly marred, in that the five-member committee did not provide any of them with the required four votes. Weinstein, however, was the only one of the four to receive votes from both sides of the political spectrum in the committee. He will assume the position this coming January, and his term will last for six years. Specializing in representing clients accused of white-collar crime, his office has represented the late President Ezer Weizmann, Prime Minister Binyamin Netanyahu, ex-Prime Minister Ehud Olmert, Knesset Members, and others. Born in Tel Aviv in 1944, married and the father of three, Weinstein worked for seven years in the Central District Prosecution Bureau, and opened a private practice in 1979. Weinstein will succeed outgoing Attorney General Menachem Mazuz, who in turn followed incumbent Supreme Court Justice Elyakim Rubenstein. 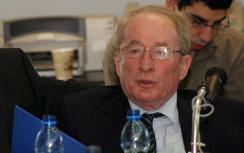 The list of Israel’s heretofore 11 Attorneys-General includes prominent persons such as Eichmann-prosecutor Gideon Hausner, Meir Shamgar, and Aharon Barak - but does not include MK Roni Bar-On, who held the position for under two days in 1997, and was forced to resign in the wake of what became known as the Bar-On/Deri affair.